These Events Calendars and Weekend Posts are ordered by date. They start from the current month and go back in time. Also note that the first two calendars shown are for: 1) the Gotham Buzz Events Calendar assembled by our staff monthly and updated weekly or more often. And 2) the Members Events Calendar which is comprised of member submitted events. 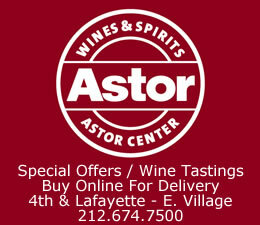 Click here for the current calendar of NYC things to do. 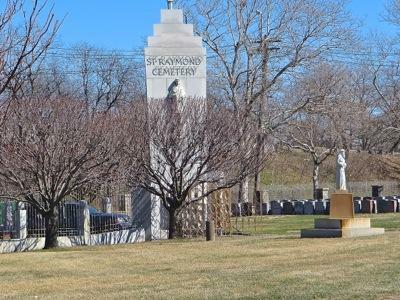 April 20, 2018 / Things To Do NYC / NYC Neighborhoods / Gotham Buzz NYC. Good Weather. The Temperature highs will be in the low 50's Friday, rising to the low 60's Saturday and Sunday. The temperature lows will be around 40 throughout the weekend. There's No Rain in the weekend forecast. Winds will be a blustery 20 mph Friday and then falling to a low breeze of 10 mph for the rest of the weekend. The Humidity will be about 40% throughout the weekend. 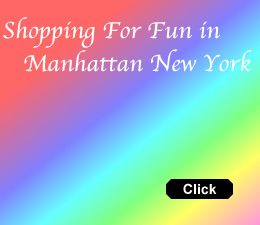 Click for Manhattan Weather. 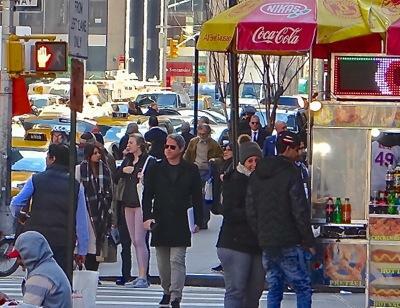 The photo at right shows a Midtown mid morning street scene along 6th Avenue earlier this week. 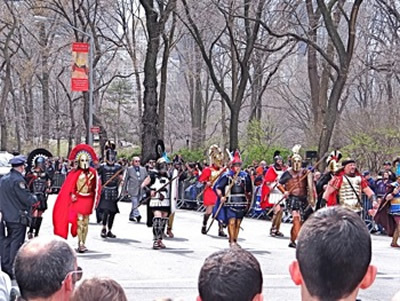 Art Expo, Tribeca Film Fest & Greek Independence Parade & more - see Manhattan Things To Do. Earth Day, Modern Dance performances, Avante garde theater, Greek Flag Raising & more - see Queens Things To Do. Kids Comic Con, Orchid Show, Bone White performance & more - see Bronx Things To Do. 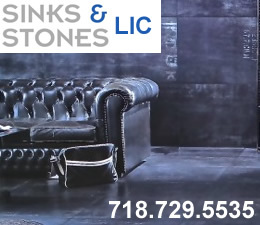 Coming shortly are Brooklyn Things To Do & Staten Island Things To Do. In the meantime click here for a listing of Brooklyn Farmers Markets, Brooklyn Street Fairs, Staten Island Farmers Markets & Staten Island Street Fairs where you can find unique items and fresh foods. Street fairs wind up in March / April and so do most farmers markets, but a few of the farmers markets continue year round. 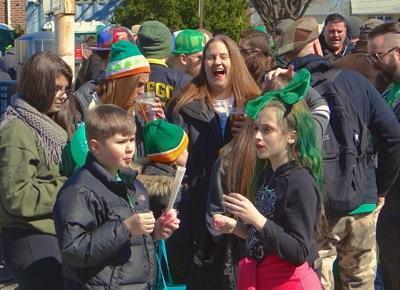 CLICK here for the rest of our report including photos of the Bronx St. Patricks Day Parade in Throgs Neck. 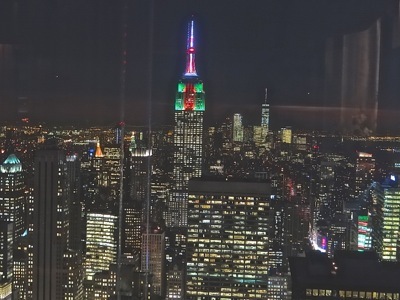 January 2, 2018 / New York City Neighborhoods / New York City Holidays / Gotham Buzz NYC. For many of us, yesterday started the beginning of the new year. 1. The first guidepost is to keep things as simple as possible by letting things go, so I can change and evolve who I am. Over time it's important to learn to let go of the past which includes letting many of the people, projects and things - that were once so meaningful and relevant - fade away with time. This process involves discarding much of what one collects, in order to open up life to make room for new possibilities. 2. The second guidepost is to take care of the vessel that carries one's being - meaning taking care of the body because it's the only one we'll ever get, and it has to last an entire lifetime. This means consuming the foods that will enable the body to function properly and ward off disease, while recognizing that satisfying the mind is important too, as it's a part of the body. There are three elements to this guideline. a _ Try to maximize consumption of natural foods while managing / minimalizing consumption of the delicious processed foods that come in packages. Read package container nutrition labels which indicate the amount of fat, sugar, sodium and cholesterol consumed per serving. The balance of natural and processed foods will shift depending on what's going on in life. b _ Reduce consumption of toxins by first paying attention to the quantities consumed of them, and then by substituting the toxins with healthier choices. For example dilute a soft drink with seltzer water [cuts sugar], or swap in a lemonade for a beer [cuts alcohol], or swap in pretzels for potato chips [cuts salt and fat]. Over the years these little substitutions can add up to some fair measure of weight loss, and can aid in maintaining generally good health. But it's also important not to deprive oneself, too much, of some of the simple pleasures in life that keep one going - because my experience has been that whenever I'm too draconian, there's a subconscious rebellion, and the program doesn't work. c _ The third element of this guidepost is to try to walk and bike whenever possible. It's a good way to kill two birds with one stone as it enables getting somewhere, while also getting some exercise. And be sure to carve out enough time each night, for a proper rest. 3. The third guidepost is to try to move your life in the direction of your interests. This will likely take a great many years, as well as needing to make a good number of economic and other trade offs. But if successful, one can then spend most of their time doing the things that totally engage them. It's said that "when someone is doing something they truly love, they'll never have to work another day in their life." 4. And the fourth guidepost is to keep on learning, because "luck is when preparation meets opportunity". So the more you learn, and the more experience you get, the better prepared you'll be ... come what may. May your new year be filled with promise and possibilities. Best wishes for a happy and successful 2018. July 9, 2016 / Things To Do NYC / NYC Neighborhoods / Gotham Buzz. On Saturday the temperature high will be in the mid 70's rising to mid 80's on Sunday. The temperature lows will be in the high 60's thru the weekend. There's a 20% chance of rain both days. Winds will be 10 - 12 mph and humidty will range from about 70% to 80% Saturday, falling to 50% to 60% Sunday. Photo. The photo at right was taken in Midtown / Village a few years back at the LGBT Parade. Click MTA Link for weekend subway work updates. 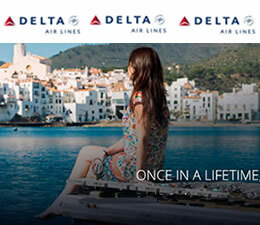 Click here for details on the MTA Weekender. Intrepid Sea, Air & Space Museum is located at Pier 86 - at 46th Street and 12th Avenue [history / kids]. The Frick Museum is showing an exhibit entitled Porcelain: No Simple Matter through April 2, 2017 [art]. Photo. The photo at right was taken in Washington Square Park in the Village. Also see events running thru the weekened above - and links to farmers markets & street fairs below. Photo. 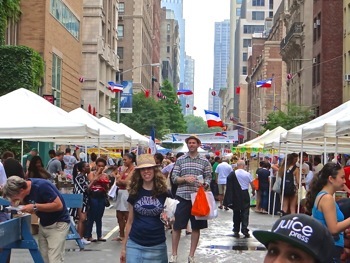 The photo at right shows the Bastille Day street fair on the Upper East Side which this year will be held on Sunday, July 10th [see NYC street fairs]. Lincoln Center hosts Mid Summer Nights Swing dance lessons at Damrosch Park beginning at 3 pm when Rodney Lopez of Dancing Classrooms teaches ballroom dancing [dance / music - free]. At 6 / 6.30 pm swingtime dance begins with the Harlem Renaissance Orchestra and there's the Ambassador Prize Lindy Hop Dance Contest [dance / music - $17]. Anthology Film Archives at 32 2nd Avenue in the East Village is featuring the film entitled Men Go To Battle through the weekend. The 98 minute film will be shown on Saturday and Sunday beginning at 4.30, 6.45 and 9.15 pm [film - $11 / $9 / $7 - www.anthologyfilmarchives.org]. At MoMA in Midtown there are several exhibits including Edgar Degas: A Strange New Beauty shows 100 rarely seen monotypes [thru 7/24] - [art / film - admission]. Photo. 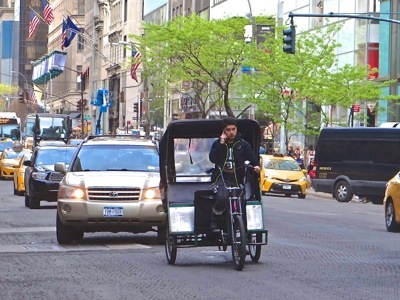 The photo at right was taken in Manhattan earlier this year on the west side in Midtown showing a cyclist cab. The Gallery shows below need some updating. *Sperone Westwater at 257 Bowery is hosting the exhibit Mario Merz: Works from the 1980's which runs through June 18th.[art]. *The Sean Kelly Gallery at 475 10th Avenue at 36th Street in NYC is hosting a solo exhibition of CONSTRUCT by sculptor / installation artist Antony Gormley through June 18th [art]. *The Luhring Augustine gallery at 531 West 24th Street in Chelsea is hosting Janet Cardiff & George Bures Miller exhibit of The Marionette Maker, which is a mixed media installation [art - ends 6/11]. *There's a closing reception for Decollation & The Spirit of Gutai art exhibits from 3 - 6 pm at the Buddy Warren Gallery at 171 Chrystie Street on the LES [art - free]. *Over The Bridge II is at the Atlantic Gallery at 548 West 28 Street, Suite 540 in the Landmark Arts Building in Chelsea until Feb 20th [art - free]. *There are a number of art galleries with interesting exhibits including Carolina NitschGallery at 534 West 22nd Street in Chelsea, which features influential modern American artists like Mike Kelley, who died a few years back [art]. And the Pavel Zoubok Gallery at 531 West 26th Street in Chelsea [art]. Photo. The photo at right was taken at one of the Summer Garden jazz performances at MoMA in Midtown. SummerStage features Justin Roberts & The Not Ready for Naptime Players / Mister G / Finding Neverland / Purelements / Gizmo Guys at Rumsey Field in Central Park opening at 2 pm with the show running from 3 pm to 6 pm [music - free]. 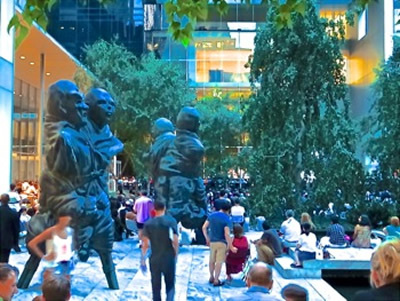 MoMA Summer Garden begins with doors opening at 7 pm and the 90 minute concert by Julliard musicians beginning at 8 pm [music - free]. This week it's New Music for Mixed Ensembles and MoMA is located at 11 West 53rd Street between 5th and 6th Avenues - but NOTE the sculpture garden entrance is on 54th Street. The calendar includes art exhibits at many of the major museums including MoMA, the Frick Collection, the Guggenheim,and theMetropolitan Museum of Art.We also list a number of foreign / indie film theaters. 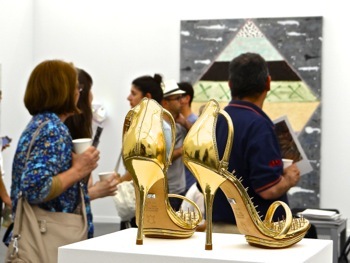 See art galleries & musical performances above in Friday & Saturday listings. 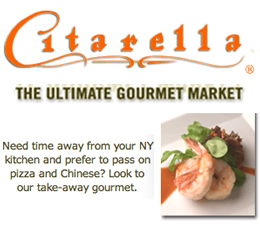 We also provide a listing of NYC Street Fairs & NYC Farmers Markets where you canfind unique items and fresh foods. Street fairs wind down in November and so do most farmers markets, but a few continue year round. Lastly, but not least, we hope you'll patronize the advertisers who provide us with the funding to publish this web magazine. Thanks for your interest and have a nice weekend. Weather Forecast as of July 9, 2016 for week of 7/11 - 7/14/16. This week the temperature highs will start in the low 80's rising to the low 90's by Thursday. The temperature lows will start in the high 60's rising to the low 70's by Thursday. There's a 10% to 20% chance of rain, rising to 50% by Friday. Winds will be 5 - 10 mph Monday & Tuesday rising to 10 to 15 mph Wednesday & Thursday. Humidty will range from about 65% and higher. There's a free Mostly Mozart - 50 Years exhibit, at the NY Public Library for the Performing Arts in the Plaza Gallery of Lincoln Center - opens at 10.30 am daily [music / art - ends August 27, 2016]. Photo. 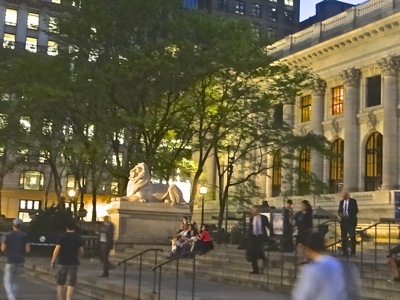 The photo at right was of the NY Public Library on 5th Avenue adjacent to Bryant Park in Midtown. At Bryant Park at 42nd Street & 6th Avenue, blankets can be laid beginning at 5 pm, the film starts at dusk about 8.30 - 9 pm, and the film is The Palm Beach Story [film]. Tredwell Merchant House Museum is located 29 East Fourth Street in the Village and hosts evenings in the garden starting with a tour at 6.30 pm and free light refreshments until 8 pm [history - $13 / $8]. Eventually we also have a Member Calendar into which non-profits, arts and community organizations and other groups are welcome to post events. Contact us using the About information and we'll send along alink with instructions on how to create an ID and post events free. September 19, 2016 / Gotham Buzz. This page contains a few of the classical things to do in Manhattan over the Labor Day Weekend. 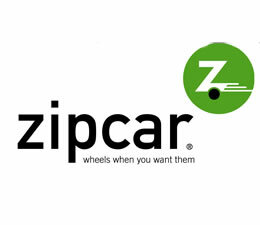 Go to the Things To Do section of this site for an enhanced list of options. 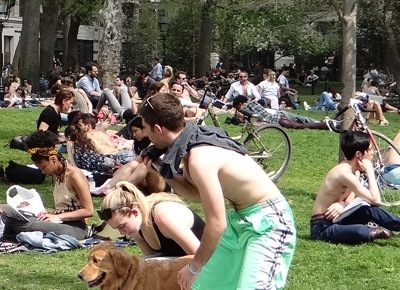 Click here for a brief report about Things To Do Labor Day Weekend NYC. May 8, 2018 / New York City, NYC / Gotham Buzz. 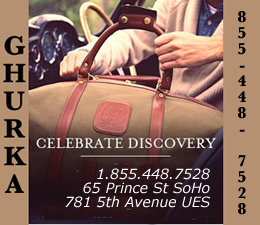 ONE OF THE MOST COMPLETE NEW YORK CITY EVENTS CALENDARS contains notices of things to do in some of the boroughs of NYC including art exhibitions, films, theater, live music, comedy, dance, sports social events, classes, and restaurant reviews for the upper east side, upper west side, east village, west village and midtown neighborhoods of Manhattan NYC for August 2016. Click here to view the Things To Do In New York City this weekend during the month of May 2018.